You are here: Home / Activities with Kids / Fun Swimming Games For Kids! Fun Swimming Games For Kids! Spring is finally here and as the weather starts to warm it is the perfect time to try out some fun swimming games for kids! Do you have favorite pool game you played when you were a kid? Or, are you looking to try some new games? Here’s some fun water games you can try the next time your family takes a trip to the pool! Shark in the Water – To play Shark in the Water, one person is assigned to be the “Shark”. All other players than have to jump into the pool and swim across to the opposite side of the pool without being tagged by the shark. Once someone is tagged by the shark, they become the new shark and play continues. Volleyball and Basketball – Setting up a net or a hoop in the pool will let you enjoy some of your favorite sports in the pool as well. You can be creative and turn a noodle into your volleyball line or make an intertube your hoop if you want to try these in games at a public pool. Marco Polo – One player starts as “It” in this classic tag game. The starting player must use their sense of sound (no peeking!) to try to find the other players in the pool. If they need help, they can call out “Marco!” and all other players must reply “Polo!” Swimmers are allowed to move and avoid being tagged throughout the game. They can even hop out of the pool but beware – if you are out of the pool and the player that is it calls “Fish Out of Water” you are considered tagged. Once one player is tagged (or caught by the Fish Out of Water call) that player becomes the new start player who will search for the rest of the swimmers. Diving for Toys – Using diving sticks or sand weighted diving toys is a fun way to encourage children to get their faces wet and build confidence in the water. Younger kids can start by “diving” for toys placed on the steps and within easy reach. Older kids can challenge themselves by using the toys in deeper areas of the pool or try to grab them from the bottom of the deep end using a diving board. Noodles – Pool noodles and can be used for so many different games and activities in the pool. Try filling up the hollow hole of a noodle with water and then blow hard to create a stream of water that shoots out like a whale. Or, sit on the center of the noodle and practice balancing and floating on the noodle. Torpedo Catch – Torpedo styled toys that can be gently pushed and make their way a long distance through the pool are really fun spin on a traditional “catch” type of game. You can pass the torpedo back and forth under the water or try to sneak it past your opponent to score a point for more of a challenge. 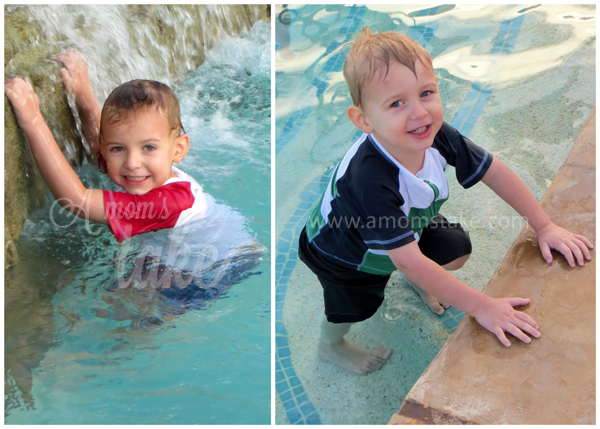 My kids absolutely love going to the pool and they have come up with all sorts of their own creative games they love. We’ve tried most of the pool games I mentioned above but some they are still a little bit young for since my boys are 2, 4, and 6. One of their favorites they have come up with is a classic children’s game that is usually played out of the water. They hang onto an adult either piggy back style or holding onto your arms while in the pool. Then, the adult spins them around and around singing “Ring Around the Rosey”. At the end of the song as we sing “… all fall down” the child gets tossed up lightly into the air and splash into the pool. For younger children, we just lightly splash them in the pool while still holding onto them. My boys also absolutely love diving for any type of toy from diving sticks, cute sand weighted pool toys, or even just their goggles. They also spend a lot of time floating and riding on pool noodles like its their own personal water car. Living in Arizona, we are frequent visitors to our local community pools throughout most of the year. I know how important protection from the sun is for my kids to not only avoid sunburns but also help against potential skin damage and dangers in their future from all the sun exposure. We absolutely love using swimsuits with built-in UV protection as it just makes sense and makes getting ready so much easier since we don’t have to use as much sunscreen. SwimZip is an innovative swimwear companies that offers rash guard swimming suit tops that have a zipper down the front making it easier to take off the wet swimming top. Their coordinated suits have UV 50+ protection that protects from both UVA and UVB rays. The zipper top makes it really simple to undress after having fun swimming. My boys are pretty independent and used to getting themselves dressed but wet swimwear means they usually need help. With the SwimZip suits, though, they are able to take off their wet top by themselves since they easily unzip. Plus, the suits really adorable and come in really cute pairings! SwimZip swimsuits come with both a top and a bottom for just $29.99. They also have individual tops available if you already have a swim bottom. Styles are available for newborns up to size 5T. Previous Post: « Get pregnant fast with the “Strength” of Uconceive! We love splashing around in our neighborhood toddler pool! We love to get water shooters and just splashing in the pool! We dont really have any pool games yet! But hopefully we will have some this summer! As a kid, I always liked the pool better than going to the beach because I could clearly see the bottom. I would think that would be a common fear in children. We’re hoping our daughter does better in the water this year. She’s definitely been talking a lot about going swimming and visiting her Grammy’s boat. Well since dd doesn’t swim yet and swim classes last year were a bomb since she was afraid to go under the water until the last 2 days, we don’t have any favorite pool games…yet! LOL She does LOVE playing in the sand and ocean though! We love diving for things at the bottom ~ it makes for a fun game! We like to have swimming races! My older kids like to go and swim but when they start to get tired they play a towing game where the younger ones get to ride on their back around the shallow end of the pool. That is the younger kids favorite thing to do at the pool! My daughter loves our community toddler pool! We spend the summer in it! She would love the cute Sassy Surfer swimsuit! My kids love the donut rings and they paddle with their hands and race to see who reaches the other side first. Honestly I play it too, lots of fun.